This week, we’re introducing iOS Account Wipe (i.e. Selective Wipe), which allows Google Apps admins to safely delete an employee’s corporate account and data from their iPhone or iPad without impacting that employee’s personal space (e.g. their personal photos). The existing Remote Wipe functionality, which allows admins to wipe an employee’s entire device, will remain unchanged. In addition, as part of an ongoing effort to make Android even more valuable to our customers, this week we are launching enhanced functionality for Android Mobile Application Management (MAM), a core capability that we introduced with our initial support of Android for Work. These new features can help admins get their employees up and running on Android for Work faster (with auto-install into an employee’s Work Profile) and stay productive (by preventing employees from uninstalling certain apps)—while at the same time keeping data protected (with widget control). 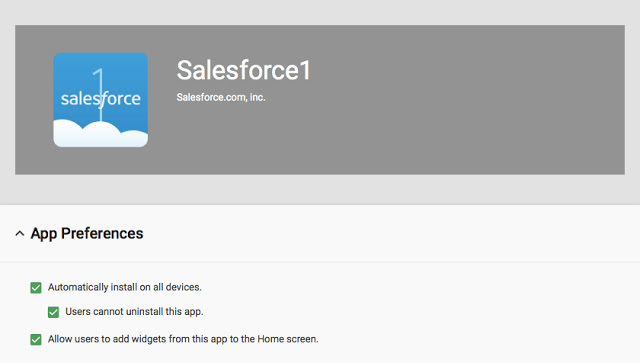 The Google Apps Device Policy app for Android is concurrently updated to display additional information about the device when the employee is using a Work Profile (e.g. the unknown sources status, developer options status, and domain names of other accounts added to the Work Profile).